Because the Fed in the U.S. and central banks around the globe have pushed interest rates down to artificially low levels, this has caused investors' required absolute return on stocks to decline. On Wednesday, the FOMC meeting announcement will take place around 2:00 p.m. 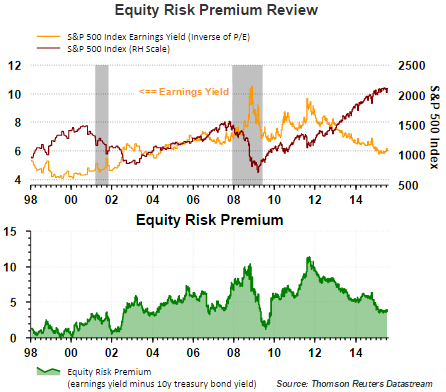 There remains disagreement on when the Fed will raise short term rates, but if short term interest rates rise and cause a commensurate increase on the long end of the interest rate curve, this could place downward pressure on stock prices as the ERP is shifted lower. What can offset this narrowing of the ERP is strength in corporate earnings. However, earnings in Q2 2015 are estimated to decline around 3-4%. On the positive side, earnings comparisons are expected to improve in Q4 2015 and Q1 2016. This improvement in earnings growth is a result of companies lapping the headwinds from energy and the strong U.S. Dollar. 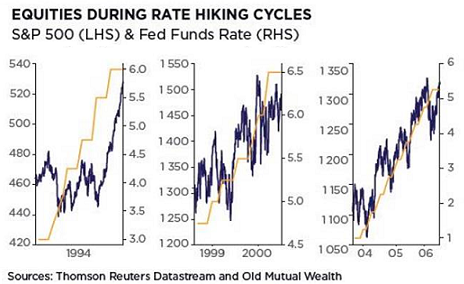 As the below charts show, in the short term, equity prices tend to decline at the onset of a rate hike by the Fed; however, the market tends to adjust and equities move higher over the rising rate cycle. We discussed this in a post early in 2014 titled, Rising Interest Rates Can Be Good For Stocks. For investors interested in a more in depth review of the ERP, Aswath Damodaran, a professor at Stern School of Business at New York University, publishes a frequently updated paper on the various methods utilized in calculating the ERP. At this point in time, if investors believe the Fed is very near starting to increase interest rates, stocks that could be impacted the most are the higher valuation equities and momentum stocks. It is these two types of equities that have attracted the most investor attention this year.